Dollhouse Decorating! 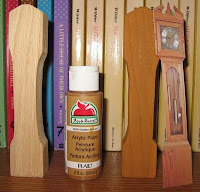 : Make your own dollhouse grandfather clock! Make your own dollhouse grandfather clock! A grandfather clock in a dolls house looks neat tucked into a corner, or as a centerpiece on a wall. You can use our picture to make your own doll house clock! It's from a photo of a clock my brother-in-law made in high school. Depending on your level of woodworking skills, you can simply paint a block of wood and glue it on the front, or if you have a scroll saw, trim the block of wood to match the clock's shape, paint and glue. Cover with clear acrylic sealer, if desired. The finished clock should be around 6 inches tall. For instructions on how to make a small dollhouse clock (for a mantle or chest-of-drawers), please see this post.